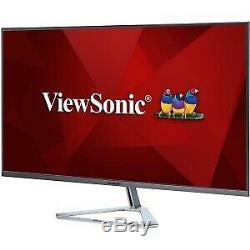 Viewsonic Ultra Slim VX3276-2K-MHD 32 WQHD 2560x1440 4 ms LED LCD IPS Monitor. VX3276-2K-mhd 32" WQHD IPS Monitor with a Stylish Ultra-Slim Frameless Design The ViewSonic VX3276-2K-mhd is the perfect blend of style and performance with features that include a sizeable 32" frameless bezel, a minimalist design, and WQHD (2560 x 1440) resolution. Design features such as an ultra-slim profile, metallic silver triangle stand, and a sleek edge-to-edge frameless bezel give the monitor a premium feel that fits nicely both at home and in the office. VX3276-2K-mhd leverages IPS panel technology and rich 10-bit color to produce an extensive array of vibrant colors with wide viewing angles. Stereo sound is provided by the monitor's dual integrated speakers, while DisplayPort, Mini DP, and 2 HDMI ports offer flexible connectivity options for both general usage and gaming. The monitor takes on an architecturally inspired design aesthetic fused with modern form factors such as an ultra-slim profile, modern frameless bezel, and a unique triangle stand. A large 32 WQHD (2560 x 1440) resolution screen delivers vividly detailed images , and up to 70% more displayable on-screen content than standard Full HD (1920 x 1080) resolution. Enjoy rich, vivid color with consistent levels of brightness, no matter the vantage point. IPS panel technology, the VX3276-2K-mhd monitor delivers the same image quality whether you are looking at the screen from above, below, the front, or the side. By utilizing 10-bit color, VX3276-2K-mhd is able to produce a color palette of over one billion colors, resulting in richer, more vivid color reproduction, smoother gradients, and a more natural transition between hues. ViewSonic'sViewMode includes optimized "Game, " "Movie, " "Web, " "Text, " "Mono", and "Mac" presets. Each presets offers specialized enhancements to gamma curve, color temperature, contrast, and brightness to deliver the optimal viewing experience for different applications. DisplayPort, HDMI, and miniDP inputs offer a wide range of compatibility, giving you the ultimately flexibility whether you are watching a video, playing games, or working. Flicker-Free technology and a Blue Light Filter help to eliminate eye strain from extended viewing periods. VX3276-2K-mhd's dual integrated stereo speakers deliver powerful sound. When paired with incredible screen performance, the combination provides complete multi-sensory immersion. VX3276-2K-mhd's energy-saving Eco-mode is ENERGY STAR compliant and incorporates energy efficiency and power savings into the monitor's stunning screen performance. Conveniently mount the monitor to your preference by utilizing the 100mm x 100mm VESA-compatible mount design. The item "Viewsonic Ultra Slim VX3276-2K-MHD 32 WQHD 2560x1440 4 ms LED LCD IPS Monitor" is in sale since Wednesday, October 31, 2018. This item is in the category "Computers/Tablets & Networking\Monitors, Projectors & Accs\Monitors". The seller is "nothingbutsavings" and is located in LaGrange, OH. This item can be shipped to United States.